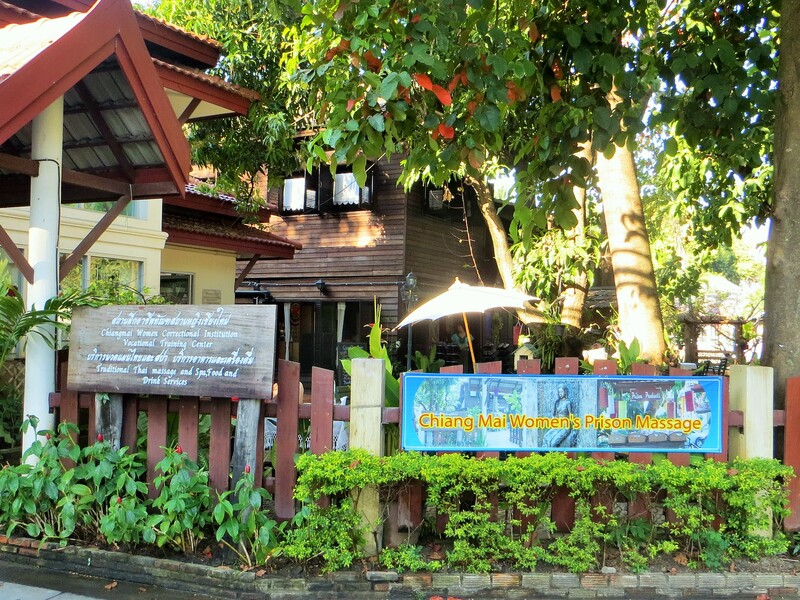 A $20 room in Chiang Mai gives our budget some breathing room. Surrounded by a moat and adjacent to a river, this city has a friendly small town feel. 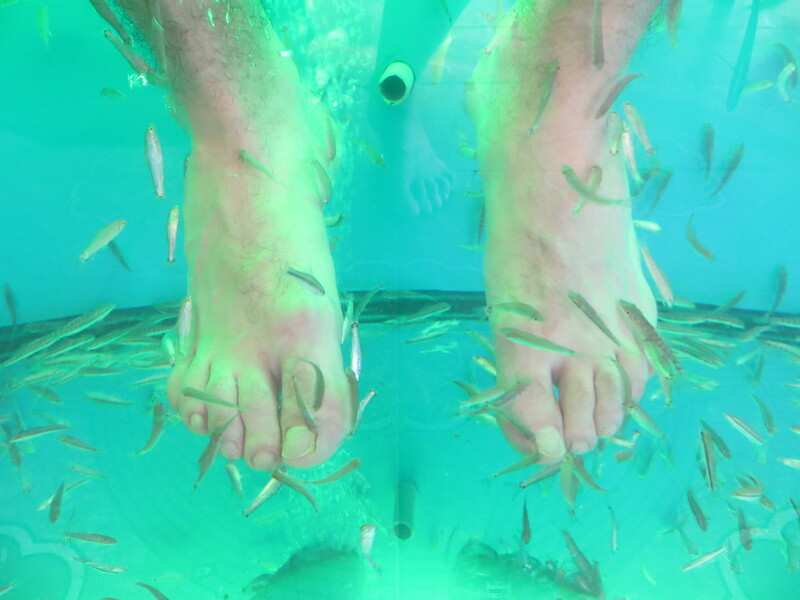 We will pass on the foot cleaning fish (though I can’t help but wonder what would happen if I douse my tally whacker in there), and opt for a half-price massage by inmates at the women’s prison. Hey, as former probation officers we cannot resist the vocational training aspect. Mare opts for the foot massage, and I take the entire one-hour Thai…where my painful hour ends when the gal almost twists me off the platform trying to perform some chiropractic back cracking stunt. My guess would be that she is incarcerated for spousal abuse. Ron got more than he bargained for… So much for lonely women. I am a ham. 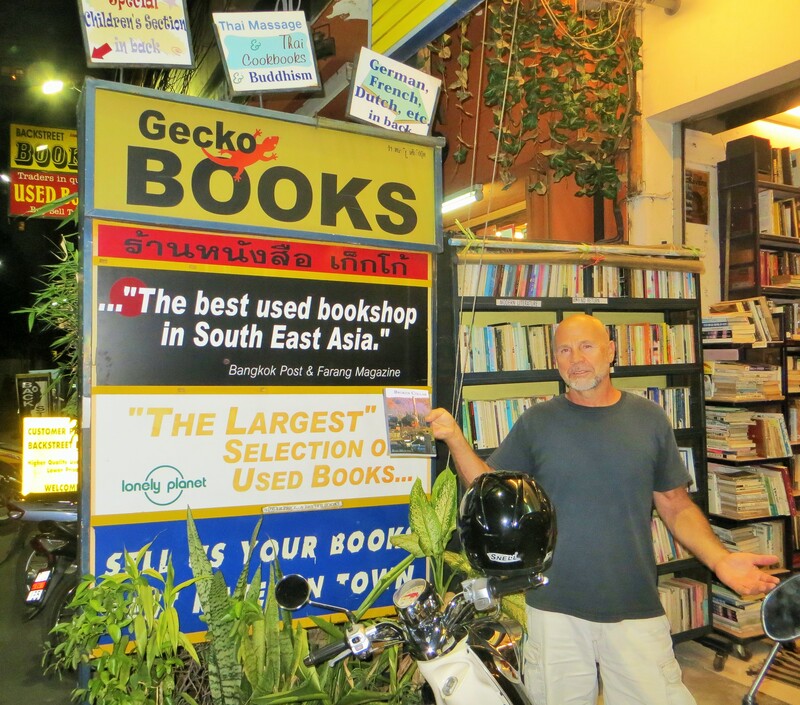 A ham I am…donating a copy of my novel, Broken Collar, to Southeast Asia’s largest used book store, which now makes a book drop in eight foreign countries. In the organic herbal garden, she breaks a piece of Aloe Vera plant. “I put on my face at night and then sleep.” She rubs her cheek. “It makes my skin smooth, but for some of you maybe it’s too late.” I love this woman! 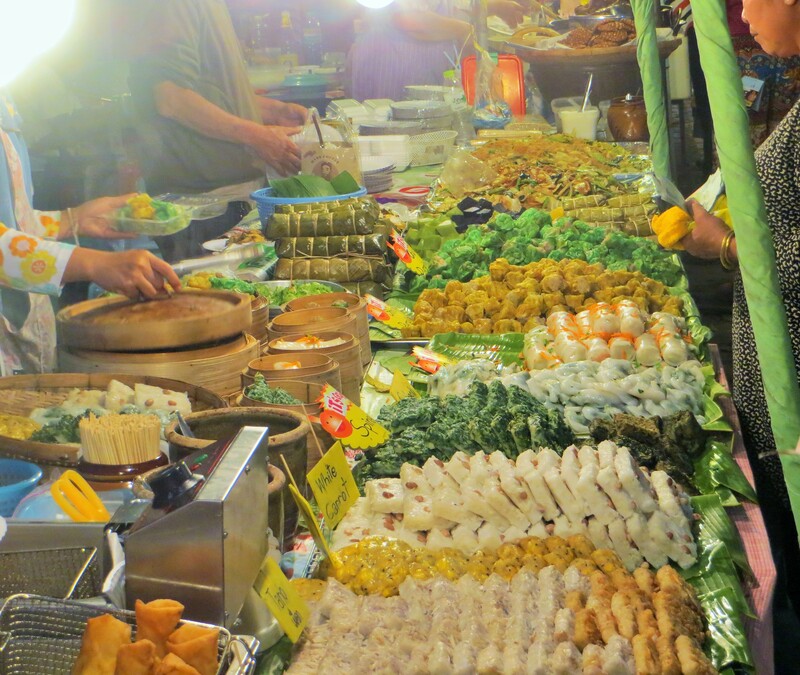 There is everything to love about the city of Chiang Mai…from delectable street food where Mare hunts skewers of chicken hearts and sushi, to more used book stores than we have ever seen. 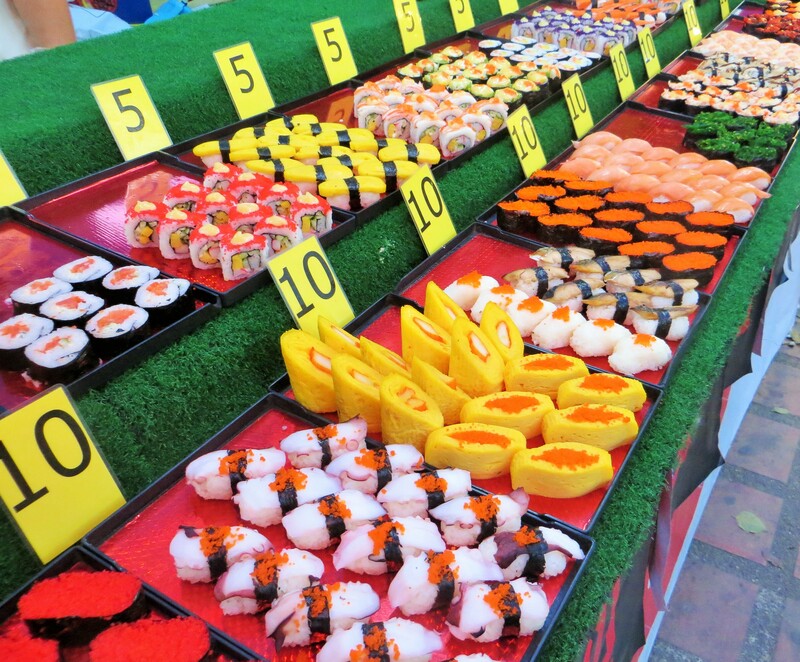 The open air markets and friendly people guarantee good deals, smiles and laughter. Oops, we just happen to stumble upon the annual flower festival, complete with beauty pageants, parades, our favorite assortment of street food, along with many flowers, of course. Just one of the many colorful floats for the parade. 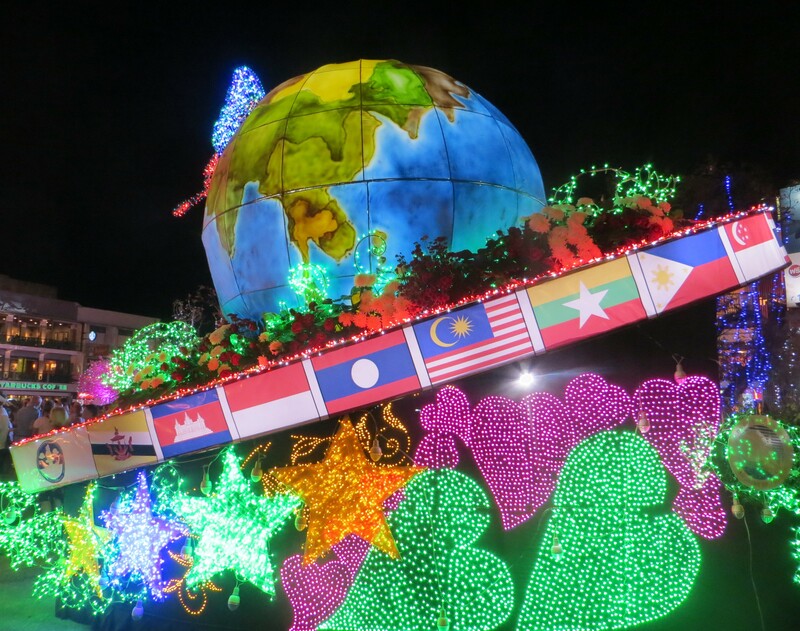 Many solo travelers visit Southeast Asia, where getting around is safe, easy and inexpensive. Since we extend our stay in Chiang Mai, we must now travel to Laos in order to extend our visas (Visa run), rather than into Malaysia as originally planned. 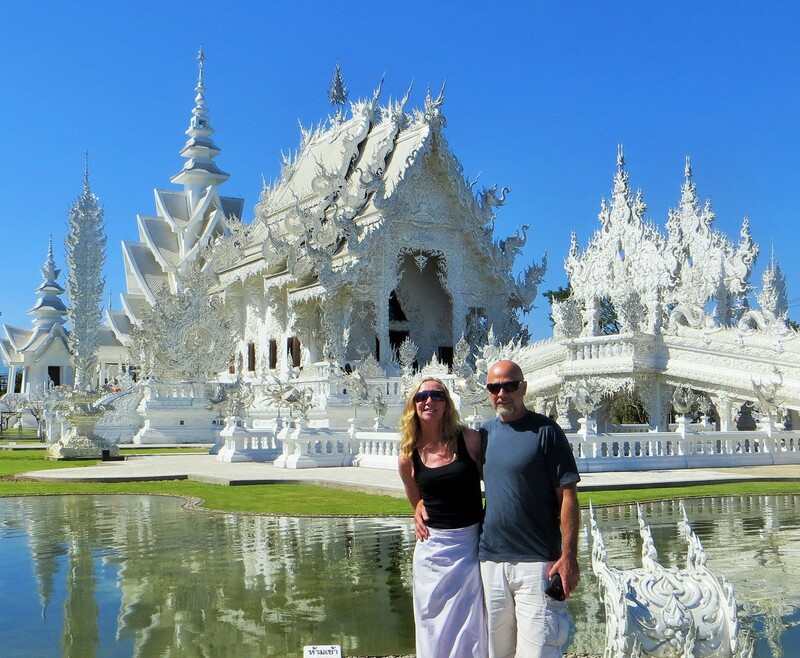 Along the road, near the town of Chiang Rai, we visit an amazing white temple, Wat Rong Khun. 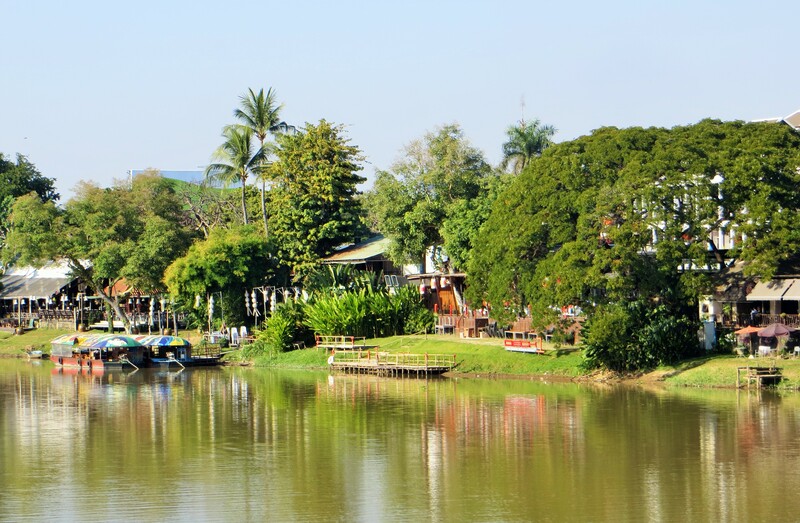 We invite you to view our next post, which will start with a two-day, slow boat ride up the Mekong River to Luang Prabang, Laos, where we make new friends from around the world. Representing Australia, England, Canada, Sweden, Italy and of course the USA! I understand why you might not choose a massage with a happy ending, but that seemed a little extreme. Hah, now that would have been downright scary! Tammy, I think she is glad she is not around to worry about us! Aw shucks, Hal. We just like to see stuff, that’s all. Everyone lives life to the fullest in their own way. Sharing the love is all that really counts. Thanks for sharing your kind thoughts, and we wish the best to you and GA! Dorothy is viewing your Blogs and says: You guys look so beautiful especially the one in front of the temple…. that would make a nice Christmas card! 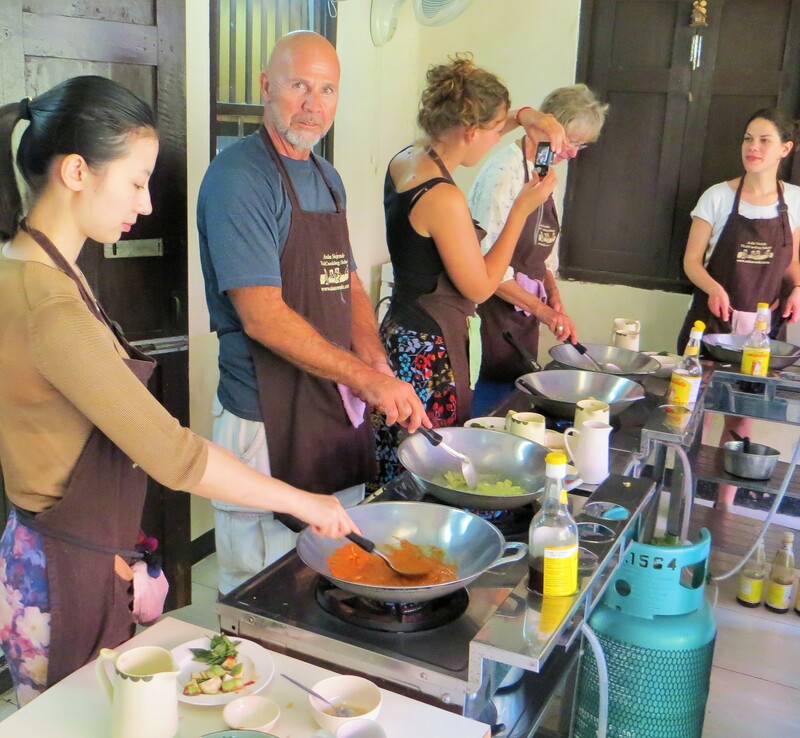 Can’t wait to see you and try your thai food cooking. You and Dad can be my first experiment!